Laminitis or founder is a disease of domestication, unfortunately laminitis can be a fatal condition of horses or ponies, but it is not necessarily a death sentence if the condition is picked up early. Causes of laminitis may vary and we will discuss these, but what is most important about laminitis is that it is not only a disease of fat ponies… Any horse is susceptible to the pain and suffering of laminitis. This information has been collected and gathered from various reputable sources, and these sources have been identified shall you want to find further information. There is plenty of information out there about laminitis, it is just finding the right information that applies to your individual situation. If you have any further queries about laminitis please don’t hesitate to contact us at Gray St Veterinary Clinic. Laminitis is the term used to describe “inflammation of the Laminae”. The laminae are the sensitive tissue or bonds that suspend and hold the coffin bone (aka pedal bone/ P3) within the hoof capsule. The laminae is important in stabilization of the foot, ensuring weight is not transferred onto the sole of the foot and also ensure the coffin bone is anchored against the pull of the deep digital flexor tendon. However this structure is very sensitive to change, and the integrity of the bond is often compromised leading to serious damage to structures within the foot, including bones and soft tissues. Once damage to the laminae occurs, the horse is in pain and the foot architecture starts to fall apart. This is why in most cases of laminitis your horse was fine one day and the next severely lame. Treatment does vary, mostly there is a rapid acute treatment program in the initial stages, and then you will proceed to take a damage control program; making necessary long term dietary and management measures. When laminitis is suspected or diagnosed in your horse, the damage control program should consist of yourself, your farrier and your veterinarian so that you can work together to achieve a well managed foundered pony / horse. Remembering that laminitis isn’t a death sentence, and appropriate successful management of the laminitic horse or pony can achieve good results. Alot of the triggering mechanisms that result in laminitis is not really understood- however it basically results from undernourishment to the laminae. When nutrients are lacking or toxins overwhelm the body, the laminae of the hoof are the first part of the body to be affected, if not corrected the course of the disease is then related to the amount and severity of damage to the laminae. Laminitis is more often a disease as a result to something else, otherwise termed a secondary disease. The primary disease that can precipitate laminitis include any disease of the gastrointestinal tract (gut), respiratory, reproductive, endocrine (hormone centres), immune and musckuloskeletal systems. Essentially laminitis occurs due to illness from a toxemia (excess toxins in the blood system), grain overload, increased weight bearing on one foot, or excessive exercise on a hard surface. Susceptibility of laminitis in your horse or pony depends on particular differences between breeds, ages and individual horses due to pasture preference and grazing patterns. Laminitis is a disease of domestication of horses due to the difference in feeding frequency, feed quality, diet composition and subsequent changes to the gut flora. A major component of diet related laminitis is due to sugars and starch content in grain and pastures. When fermented in the large intestine, these different food byproducts leads to overgrowth of starch-fermenting bacteria. This overgrowth of starch-fermenting bacteria is harmful to the horse because it triggers a ”toxic” inflammatory change in the blood stream from the acidic byproducts (of the bacteria). The scope of sugars and starches is discussed in the latter stages of this document if you wish to learn more about this topic. Lushness of pasture is not an indicator of sugar or starch content of grass, but sugar content is higher in clovers and grass seed heads than the leaf component. Abrupt changes in sugar levels differ from day to day and hour to hour, depending on sunlight, cold temperatures and soil moisture. Sugar content increase with nutrients and sunlight are plentiful or when plants exposed to winter or drought conditions. Acute laminitis can be categorized as having three sub stages (per-acute, acute, and chronic) regardless of their classification the cause is the same and so is the treatment. It is vital to identify acute laminitis and treat immediately before further damage occurs. Severe inflammation and degeneration of the laminae results in severe pain and eventually separation of the hoof wall from the coffin bone. Laminitis typically occurs in both front feet simultaneously, and only progresses to hind feet at a later stage. The typical stance of a horse with laminitis is with front feet in front of the chest and the hind feet planted under the abdomen, typically described as the “sawhorse” stance. You can have laminitis that affects only one fore foot when there is excessive weight bearing on one leg due to chronic lameness in the opposite leg (i.e horses that have undergone fracture repair of one leg (e.g right) will weight bears on the non fractured leg (left) which may become laminitic due to bearing the weight of the entire front on that one leg). In cases of acute laminitis it is vital to think about what has happened to your horse in last 24 – 36 hours as well as up to but not excluding the past 2-6 months. You can expect laminitis in your horse 6-8 weeks after a bout of colic. So it is important to make your vet aware of these historical events as they can aid in diagnosis and treatment of your horse. Chronic laminitis usually has an acute stage process at some stage and if this has not been observed or identified earlier, chronic laminitis left untreated is often when animals are euthanized for animal welfare reasons. Chronic laminitis may be described as laminitis once the coffin bone is stabilized. When radiographs are taken, the vet and the farrier are looking at the degree of rotation or sinking of the coffin bone to determine the severity of the laminitits. Definitive diagnosis is made by radiographs to look at angles and varying distances between hoof wall and coffin bone, depth of the sole, shape of the coffin bone and separation of the hoof wall. Corrective foot trimming is most important at this stage of the disease process however further progress of the disease should be addressed first. In these pictures you can see an air pocket in the hoof wall, indicating seperation of the hoof wall. You can noticeably see a difference in thickness of the hoof wall between the point of the coronary band and the tip of the Coffin bone. The final picture also shows loss of sole depth below the coffin bone, and also concave depression at the tip of the coffin bone. These pictures depict how you get the term sunken coffin bone. The bone has not yet penetrated the sole, but you can clearly see how the architecture of the foot has been lost and there are compression defects at the heel and at the toe. The concave tip of the coffin bone is from the swelling and inflammation of the lamenae behind the hoof wall. Penetration of the coffin bone through the sole. These cases are very difficult and will take some time to treat. Often many horses that reach this stage are euthanased on humane reasons. First image depicts classical hoof lines, the number of hoof rings indicate length of problem, so in this case ; it has been going for a long time. The second image show excessive heel and poor hoof conformation. The final image shows the ledge at the coronary band the indicates a sunken coffin bone. Chronic – Low Grade laminitis is the type of laminitis you may see in thoroughbreds in racing or training. These horses are typically on high grain intensive diets and under going regular strenuous exercise. These cases are often difficult to diagnose in the early phase and you may fine pain on hoof testers, increased digital pulse, mild shifting lameness of one or more feet. Radiographically these cases will not have rotation but may exhibit the ski jump formation of the distal tip of coffin bone and thickening of the dorsal (upper) hoof wall, and new bone formation on the dorsal (upper) aspect of coffin bone. Basically in these cases, high grain diets changed the gut flora which then causes changes in the laminae and the added compounding of the feet from strenuous exercise aids further damage to the laminae. Where hoof confirmation is the problem – laminitis is generally observed in horses that have long toes and low heels. This not only creates a problem in terms of changing the weight bearing dynamics but also places strain on the deep digital flexor tendon. This tendon (DDFT) which runs up the back of the leg. The strain on the DDFT is what makes laminitic horses step shorter than normal, and makes them look like they are stepping on glass. This horse may start to develop laminitis due to poor conformation seen here; long toes and low heels. This conformation would still cause intermittent lameness in a working horse even though you may not suspect laminitis. The second picture shows how this would be corrected with correct trimming and placing a shoe that elevates the heel and allows the tension on the deep digital flexor tendon to be relaxed. Treatment of laminitis may vary from time to time due to new research however, currently treatment of laminitis is mostly influenced by the cause of the problem and severity of the lameness. Laminitis treatment doesn’t have to be that technical and exhaustive, the mainstay in all treatments as said before is treating the primary problem and managing the laminitis depending on severity. Requires very minimal if any treatment to the hoof conformation. At this stage it is vital to treat the initial problem, and supply supportive measures to decrease the severity of damage to the laminae. Remember that once we feel heat and bounding digital pulses, and the animal is showing signs of laminitis the damage to the laminae has already occurred. Thus treatment aims at preventing further damage and managing the now laminitic horse/pony, that is likely to have recurrent episodes. This is where emergency veterinary support is vital. Nutritional support (low starch diets). 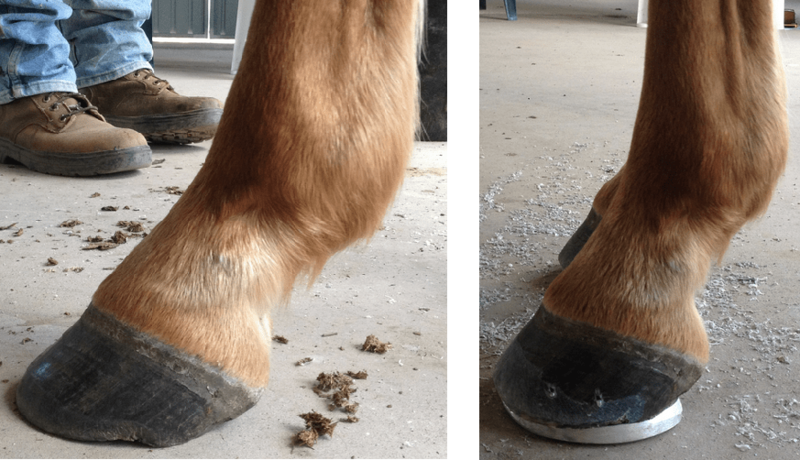 Severe – Acute on chronic laminitis – where rotation is occurring, the immediate treatment is as above, then after a week, it is important to start making necessary changes to hoof conformation. Rotation can only be diagnosed by radiographs by your veterinarian, then it is co-operation between the farrier and veterinarian to address long toes or low heels. However this is a slow process and may occur over several weeks to months. The farrier may apply comforting support to the heels and sole by placing a rubber shoe shaped to the horses foot in-between trims. Raising the heel and supplying support to the sole enables the strain on the deep digital flexor tendon to be removed and enable the horse to move freely. In severe cases where pain relief doesn’t help, there maybe warrant to cut the DDFT, with horses having reasonable athletic function providing successful recovery from laminitis. The main aim of treating chronic cases is to minimise ongoing lamellar inflammation and damage. It may be some time before the horse has recovered and recurrence is possible, particularly if exercise is resumed to early in the treatment period. Radiographic appearance of chronic Laminitis with rotation. Dotted lines showing the required changes in hoof conformation to be carried out by a farrier. How to be proactive about preventing laminitis in your horse or pony..
People often say ‘there are ponies that have laminitis and there are ponies that are going to get laminitis’. Which ever pony is yours, having a good understanding of laminitis to help you prevent or manage the condition is vital. However not to forget laminitis occurs in horses such as thoroughbreds, picking up on early stages of laminitis can save you a lot of emotional and financial hardship as well. Insulin is a potent anabolic hormone in the body that increases the accumulation of fat in the body. Insulin resistance is the inability of insulin to initiate glucose uptake by the cells in the body, this resistance is goverened by large fluctuations in glucose and insulin levels. Cells require a source of ‘energy’ in the form of glucose to carry out their necessary daily tasks. In insulin resistant animals, glucose entry into cells is impaired. The cells most sensitive cells to these changes (lack of glucose) appears to be the cells in the laminae of the feet. In insulin resistant animals, the higher the insulin levels the more fat deposition in the body. Fat ponies are the most common example of insulin resistance and thus their increase susceptibility to laminitis. Foods high in sugar is then very problematic for animals that have insulin resistance. Identifying if your horse has Insulin Resistance? To measure blood insulin levels, your horse needs to be seen by a veterinarian, and blood sample collected to be sent off to pathologist for testing. Insulin levels cannot readily be performed by ”in-house” laboratory equipment. This test needs to be performed under strict conditions advised by the veterinarian. What can you do about insulin resistance? Not all fat ponies or horses have insulin resistance, and not all insulin resistant ponies or horses are fat, but all insulin resistant animals are likely to get laminitis. There is still lots of research done into Laminitis, Insulin Resistance and Pastures every year, thus new information is coming out at a regular basis. There is definitely a correlation with these three components, with research showing that 50% of cases of laminitis could be prevented by appropriate grazing and feed management. It seems to be pelleted feeds with appropriate formulated oil-protein-fibre composition ( with under 4% starch content) result in the lowest insulin response and insulin levels resulting in subsequent reduction in occurrence of laminitis in ponies. the bad components in plants are the same bad components of human food groups, so avoid those things that are yummy and put on weight. understand that sugars and starches are simply sources of energy for the plant to grow or stay alive; thus the times when these components are found in high quantities are when the the plant is trying to grow, stay alive or reproduce – drought, winter, spring and after the wet. It is also important to note that this doesn’t just occur during the day, the process of plant growth is photosynthesis and occurs until early evening, but the plant can still contain large concentrations of starches and sugars right up until midnight before the levels start to depreciate. C4 and C3 or cool season grasses have high levels of sugars and starches in early spring, when cool night do not permit the plant to utilize their energy. This is also applies to hay made from C3 grasses that is made in spring. Grains and cereal hay like oaten, barley and rye, are harvested in their growing phase as well, thus these feeds must be pre-treated (soaked and dried) before being fed to horses. Weeds are also plants that will contain high levels of sugar and starches because their goal in life is not to die. So care must be taken to ensure animals do not resort to these plants as not only will they be high in sugar and starches but may also be toxic, typically when eaten when other feed is not available and horses eat a large component of weeds when they are hungry (or have empty stomachs). avoid grassy hays at all times unless it is soaked for 30 mins – 6 hours and air dried prior to feeding. “Tie the horse up in the dam for a few days”– this is not a complete myth, but standing the horse in mud will elevate the heels releasing pressure off the DDFT and also proved cold hydrotherapy to the feet simultaneously, however it does not completely solve the problem, corrective shoeing will have to take place as does starting it on pain relief and adjusting its diet and exercise management. Redden, R (1998)”Understanding Laminitis: Your guide to horse health care and management” The Blood Horse Inc, Lexington.